I'm getting a sewing machine for my birthday, I can sew but it's been ages and I don't have much by way of accessories. There are the obvious ... scissors, tape measure etc ... any advice on things you cannot do without or even things that are a waste of time? Also how highly do you rate an overlocker? Thanks I can't wait to start. I have been sewing for....30+ years, and the thing I rate most highly is a permanent place for your sewing machine. Hauling it out of the cupboard every time you need to use it is such a drag! If you have it out permanently, you can quickly and easily mend things, or whip up a simple garment. My overlocker is only a 3 thread; doesn't do rolled hems or anything...it was made in 1985...and it makes my life so much easier! I totally recommend an overlocker! My sewing machine is the most basic you will find....really, you only need straight stitch and zig zag to sew whatever you like. I find a basic sewing machine, plus an overlocker, much more versatile than a fancy sewing machine. It really depends on how much sewing you are going to do. I also have bias binding in white....having said that, a bias binding tool is fantastic if you are going to do alot of stuff with bias. As for scissors....Serra Sharp are the best...and keep them in their box...do not let anyone use them to cut anything but fabric! In the days when I used to make skirts and dresses, I used to keep lots of zips. When my girls were little, I had lots of pink poplin and gingham! Velcro and snaps are other staples to have on hand...plus crewel needles, as there will always be hand sewing. I hope you have a great time sewing...I know I love it...and it is a dying art! ooh yes a permanent spot for the machine! I've spent today clearing out the back room so i can do this! A good light too. A toolbox/sewing box. Quality pins (not bulk pack). A small snips/scissors as well as a big one. And if you'll be doing patterns, a straight ruler and set square. I got my first sewing machine this year and let me tell you..... I am in LOVE!!! 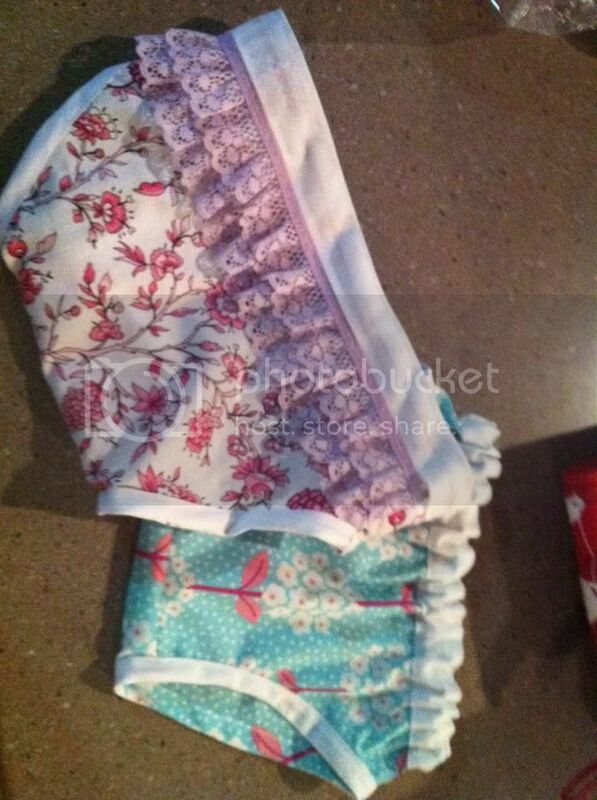 Tonight I just made two little nappy covers, and they are super cute. Its also good to have a few bits and pieces, like... A few lengths of different colour ribbon, a few off cuts of cool frilly stuff.... etc... I was lucky enough to raid my grandmothers old sewing stuff and get loads of great stuff! I have never used an overlocker, I don't know what I am missing I suppose, but I haven't needed one and there has been nothing I havent been able to do! It also depends on what you plan on sewing? Cheap as chips while I am still picking things up... (but looks good if it turns out successfully haha) and super easy to work with. I have a 2 year old daughter and sewing has been in the family for generations, we used to go "dress shopping" as kids/teens and then to the fabric shop to go home and make what we had seen. So yes, I'm very excited to get back into it. I will start thinking of a permanent place for the machine, we have a 12 seater dining table that I was thinking of using, but it's in the middle of the family room and would get disturbed. So thanks for the advice. Brand names of scissors and stuff really helps, I'm getting a few $$ to set up so I'd rather do it properly once than keep replacing stuff. I'm also not looking at a machine with a thousand functions, something more solid and the basics will do. Always makes me laugh about "the good scissors". We always said as kids what makes them so good if you can't use them when you need them? I guess that's one more tradition to pass on! p.s, here is what I made tonight!!!!!! I have to add elastic into them yet (in the white bias binding) so they kind of just look like kid knickers... haha... I'm super proud they turned out as well as they did! Wow these are gorgeous! Are the to go over dispoable nappies? I have been looking for something to go over DDs nappies in the summer with singlets!!! AP those are so cute! Where did u get the pattern from? Was it online? If so, could you possibly post the link?